With the elections fast approaching in Indonesia, leaders are hard-pressed to maintain the population’s support despite recent challenges. Religion and terrorism in particular have been thorny issues for President Joko Widodo, popularly known as Jokowi, who is seeking re-election on April 17. On January 18, the Jokowi administration announced its intentions to release 80 year-old Abu Bakar Bashir from prison over humanitarian concerns given his age and deteriorating health. Bashir is the spiritual leader of Jemaah Islamiyah (JI), the militant group responsible for the 2002 Bali bombings, one of Indonesia’s deadliest terrorist attacks in which 202 individuals were killed, including 88 Australians. JI is also believed to be a regional branch of the al-Qaeda network. Bashir himself has never been found to be directly involved in the bombing, but he was arrested on charges of funding a training camp for Islamic militants and encouraging extremists to carry out terrorist attacks. Jokowi’s preoccupation to improve his image and electability among Muslim communities before the elections seems to support the idea that his decision regarding Bashir is politically motivated. Some believe that it is a pre-emptive move to diffuse criticism ahead of the release of former Jakarta governor Basuki Tjahaja Purnama. Basuki, a Christian of Chinese origin, was found guilty of blasphemy against Islam after he quoted a verse of the Qu’ran and insinuated that his opponents had used the passage to trick Muslims into voting against him. In an analysis published by the Lowy Institute, an Australian think tank, regional terrorism expert Sidney Jones argued that the legal grounds of Jokowi’s decision are unclear. It is neither a pardon nor an amnesty, because Bashir never requested a pardon and the decision seems to violate Regulation 99 of 2012 from Indonesia’s Ministry of Law and Human Rights. This stipulates that the release of offenders such as convicted terrorists is contingent on their willingness to sign a loyalty oath to the Indonesian government. It was on those grounds that the Jokowi government later backtracked on their plan. Bashir refused to pledge his allegiance to the nation and the state ideology of Pancasila, which promotes pluralism. There seems to be no good reason as to why this requirement should be waived for humanitarian reasons. Unfortunately, the damage has already been done. Domestically, public outrage at Jokowi’s decision has alienated his supporters, which include moderates, families of the Bali bombing victims, and the police, the judiciary and the bureaucracy who were involved in the fight against JI. Along with the appointment of conservative cleric Ma’ruf Amin as his running mate, these recent decisions made by Jokowi have contributed to a growing sense among his supporters that the President is more concerned with courting the Islamic vote rather than promoting an agenda that addresses social and economic issues. At the same time, the reversal of Jokowi’s initial plan to release Bashir has also angered conservative Muslims who accused the President of making empty promises. There was no clear guarantee that this decision would help Jokowi change the minds of conservative Muslims and effectively gain their support. 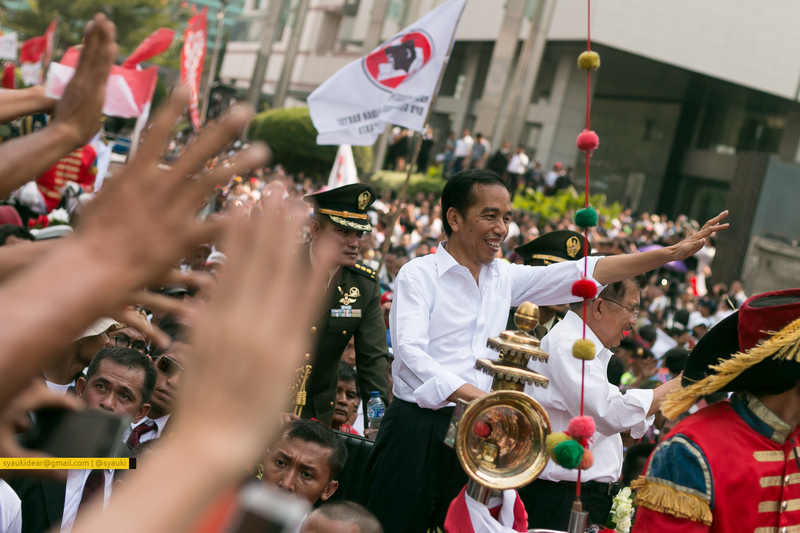 Many people who opposed the release of Bashir have also threatened not to vote for Jokowi. In Indonesia, voters can choose to cast a blank vote, or an abstention from voting. This practice, called golput, is usually interpreted as a sign that the electorate does not believe that the candidates deserve their votes. Golput was used a symbol of protest in Suharto’s authoritarian New Order regime, at a time when the winner was already determined before the election and alternative parties were either banned or tightly controlled. Recently, pro-golput voices were heard following the first presidential debate and the announcement of Jokowi’s plan to release Bashir. Jokowi supporters have begun to waver, and may choose the golput option on their ballots given that most do not see Prabowo Subianto, the incumbent’s opponent, as a possible alternative. However, opting for golput in 2019 could potentially mean surrendering the political future of the country to Prabowo and his authoritarian tendencies. Even worse, although Bashir’s influence has waned over the years, anti-terrorism experts suspect that the timing of this incident will help burnish his image as a hero of militant Islamism among hardliners. What does this incident say about Indonesia’s elections? For one, these elections may be more unpredictable than they seem. Even if Jokowi has a substantial lead over his opponent Prabowo, it would not take much more than a political scandal to potentially turn the tables. Furthermore, Jokowi’s failed political gamble demonstrates the need for leaders to be careful when pulling the religion card, which could easily do more harm than good.